The Michigan Municipal League represents Michigan's cities and villages and is constantly visiting them. 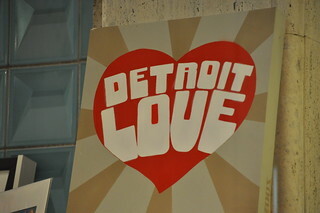 Here are some photos of the League's recent visit to Downtown Detroit. During this visit in July of 2012 we made stops at many of Detroit’s famous landmarks and tourist attractions including the Detroit Opera House, Comerica Park where the Detroit Tigers Play, the beautiful Detroit Riverwalk, the Guardian Building, Heidelberg Project and many other locations. The League believes that Michigan’s cities are key to the state’s economic turnaround. Detroit often gets criticized in the media, but often forgotten is the many, many positive activities and sights that are in Detroit every day. Learn more at mml.org and mml.org/placemaking. For more about placemaking go to the League’s website mml.org and visit the page about our Center for 21st Century Communities: www.mml.org/resources/21c3/about.html. You can also visit a placemaking blog by League CEO Dan Gilmartin called www.economicsofplace.com/. In addition, the League’s 2012 Convention taking place in October on Mackinac Island will focus on how Michigan communities of all shapes and sizes can implement placemaking assets. It’s easier than you may think. For details on the 2012 Tools of Placemaking Convention go to convention.mml.org (www.mml.org/events/annual_convention/).